Goa in India is synonymous with the fun beaches, temples, churches, and seafood. It is home to world-famous beaches like Calangute, Baga, Vagator, and Miramar that attract foreigners, Indians and even the local Goans. Also, it is famous for its numerous churches, which attract the tourists. However, Goa also has some hidden surprises for discerning travelers. What makes Goa more than interesting is its markets and greenery apart from the beaches. Goa is a tourist hub and this also makes it a shopping destination. It has some of the best markets that attract visitors and tourists from across the globe. In fact, many locals also shop at these markets. 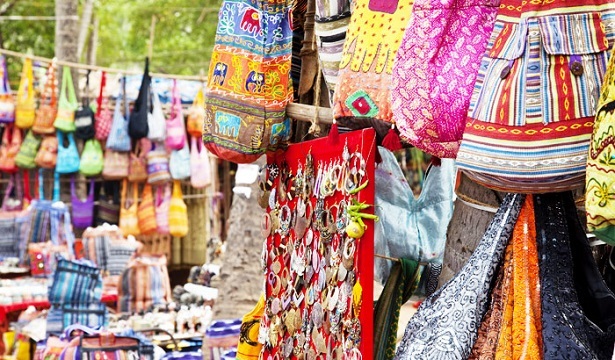 Shopping opportunities in Goa are just endless, ranging from designer malls to hippie flea markets. If you are good at bargaining, then you will surely have a great shopping experience in Goa. 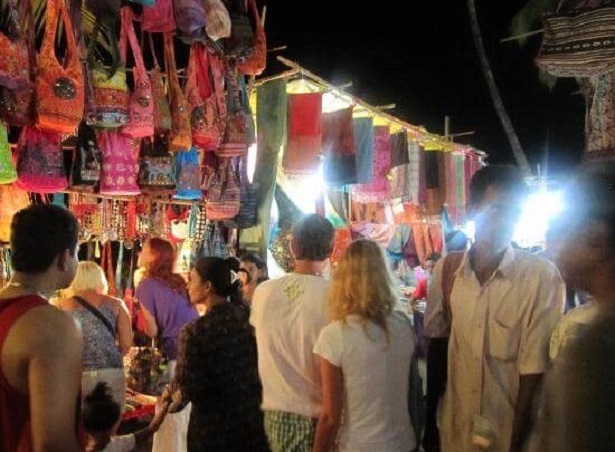 Even there are many stalls near the beaches to pick up chic clothing and funky jewellery. To help you to have a great shopping experience in Goa, few of the best shopping areas are mentioned below. 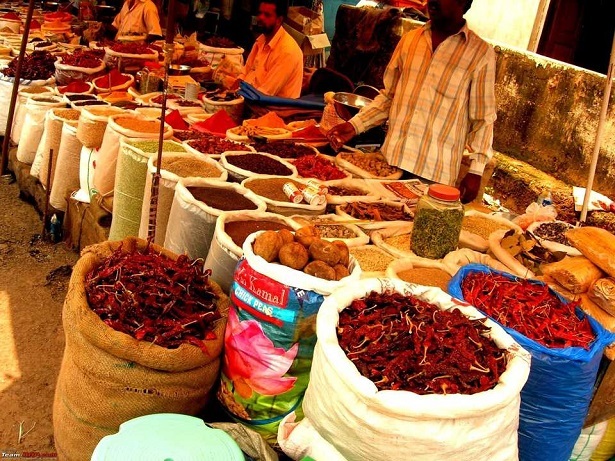 The best place to head for shopping in Goa is the Margao Market. Here, you will get an ultimate experience of street shopping. You will find nearly everything and for everybody. Needless to say that you will find a wide variety of cashews, as Goa is famous for cashew nuts. In addition to that, you will also find different varieties of alcohol, local and branded liquor. Margao Market is one of the best and largest shopping places in Goa. You can also search for a wide range of handicraft, clothes, and shoes in this market. This famous market in Goa sells everything under the sky, right from clothes to other household items. The market is a favorite haunt of tourists, who come to buy handicraft and clothes from all Indian states, like Kashmir, Gujarat, and Mumbai. You will also find foreigners setting up stalls and selling food and other items. The entire market has a festive and hospitable ambience. 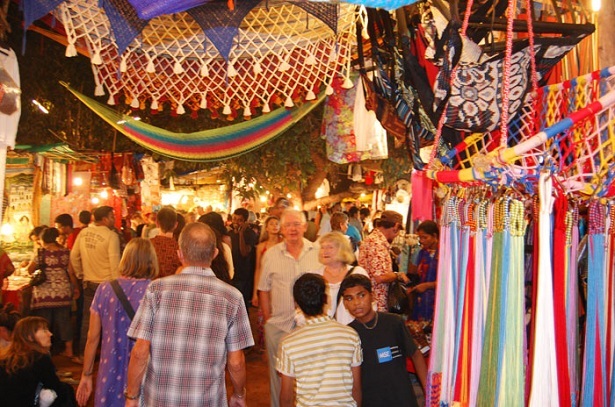 In fact, many travelers rate Anjuna’s Wednesday Market as the best shopping place in Goa. Have you heard about Mario Miranda any time? Yes, the famous cartoonist from Goa. His cartoons adorn almost each and every wall of Panjim Market. This market is famous for port wine, cashew nut, vegetables, and souvenirs. Panjim Market is also the best place to catch up with the locals. Mapusa Market is famous for Goan fish. If you are planning to have a beach party then you should head over to this market. Here, you will surely get the seafood at attractive prices compared to other parts of the state. The fish, prawns, lobsters, and crabs are fresh, but you can also get them in dry form that many Goans buy and hoard during the monsoon months. In addition to this, you will also find clothes, belts, and other accessories at cheap prices. 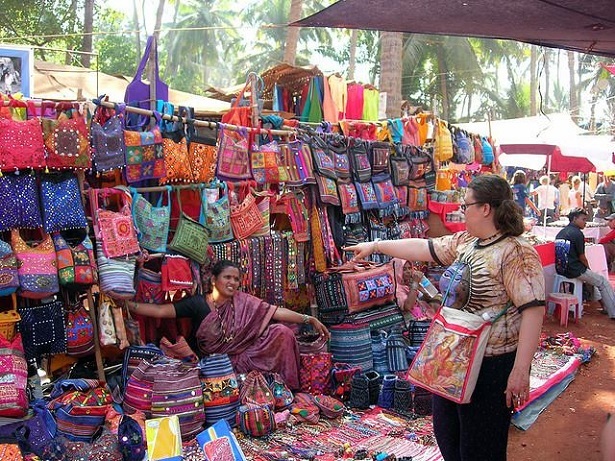 This market is open from October until May, and is set up by the Tibetan refugees living in Goa. 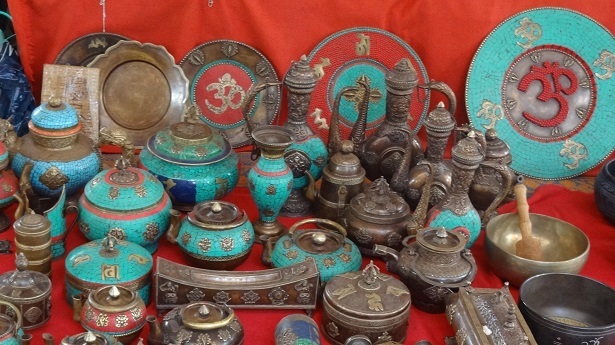 If you are in search of cool shopping places, then do visit the Tibetan Market. You will find different beautiful Tibetan stuff here, and the prices are alluring. If you are good at bargaining, then you will have lots of expensive jewellery and clothes in your shopping bag at the end of the day. The market is also a great place to buy carved furniture. This market opens at 6 pm every Saturday and stays open until midnight. Whenever you happen to visit this market, please don’t forget to buy handbags and apparel. Shopping at Arpora Night Bazaar is an experience in itself. 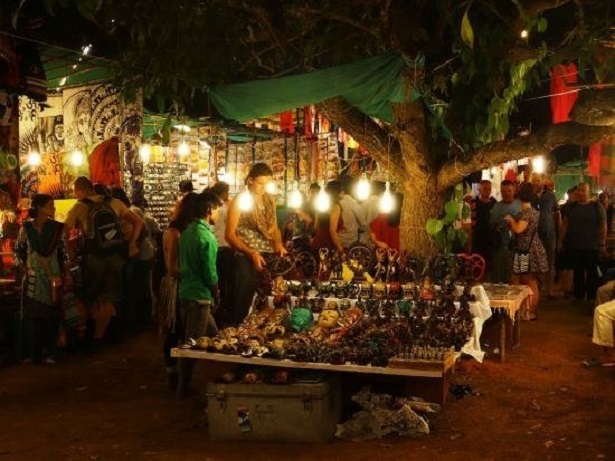 The market attracts all types of shoppers, who come looking for foodstuffs, herbs, spices, handicraft, bags, fashion accessories, clothes, designer jewellery, and also rugs and carpets. The night factor at Arpora not only allows you to shop in pleasant weather but also adds a happening feel to it. 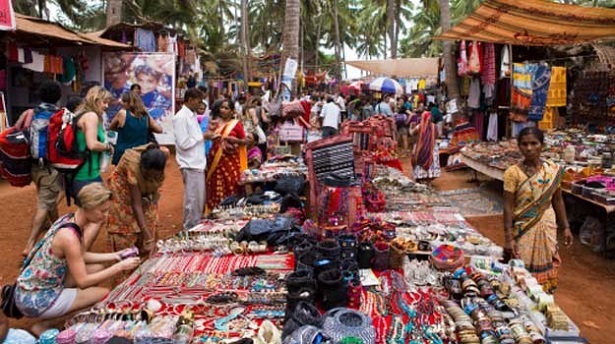 In Calangute Market, you will find trinkets, beachwear, and carpets in large quantity. Calangute is one of the most famous beaches in North Goa and the market has food stalls and shacks that sell everything, right from the clothes, seashells, and local handicraft along with the food. You will love the delicious seafood and chilled beer served in the shacks. Even this is one of the best shopping places in Goa, it hides away some surprises you would not want to miss. 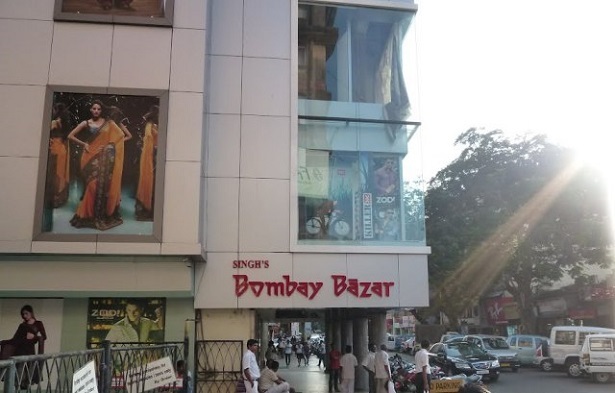 Do visit Bombay Bazaar in Panjim. Housed in a building, this is a market like none other. Here, you will find clothes, toys, costume jewellery, shoes and more. In addition, there are body painters, and body and nose piercing experts in the market. When it comes to enjoying music, shopping, and dinner at one place, then Mackie’s Night Bazaar is the right choice. Here, you can find nearly 100 stalls that sell food, clothes, jewellery and other things. You can also show your dancing skills on the dance floor and satiate your hunger with lip-smacking seafood. Apart from having a wide range of clothes, belts, and other fashion accessories, this market has one more source of charm – the River Baga which flows nearby. This is one of the best shopping places in Goa that makes a person’s heart leap with joy. The market has a party ambience that makes it extremely special and unique. Literati is located in an old Goan building and serves as a bookstore, café and meeting place. You can take part in book reading events and workshops and also go through their collections of new and used books. This is a great place to relax and unwind. The famous designer Malini Ramani has set up her boutique just opposite St. Anthony’s Chapel in Calangute to serve your sartorial needs. This is a great place where you can experience some of the best art and literature. It also features art workshops, exhibitions and other events and festivals. Even here you can find the best traditional and unique handicraft items that roadside stalls sell. Be sure to bargain before buying anything. If you visit these fun and exciting shopping places in Goa, you can give your wardrobe and house a complete makeover in a snap of a finger. 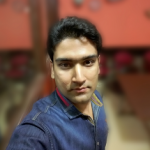 You will find a lot of things to buy in Goa, especially cashew nuts, port wine, clothing, imported cigarettes, oxidized silverware, junk jewelry, spices and precious and semi-precious stones at reasonable prices.